Mount Kenya is Africa’s second highest mountain at 5,199m (17,058 feet) and the highest of all Kenya Mountains. Mount Kenya is roughly circular, about 60km across at the 200mm contour, where the steep font hills rise out of the gentler slopes of the centered highlands. At the centre of the massif, the main peaks rise sharply from around 4,500m to the main summit of Batian 5,199m, Nelion 5,188m and point Lenana 4,985m. Other major summits on the mountain include Point Piggott 4,957m, Point Dutton 4,885 and Point John 4,883m. Of the three main peaks (Batian, Lenana and Nelion), only point Lenana can be reached by trekkers and the other two being only for technical climbers. Mount Kenya is the second highest peak in Africa and stands somewhat unjustly in the shadow of it’s taller neighbour Kilimanjaro, which lies some 320km away in the south and is visible on a clear day. Kili may see much more traffic – due to the possibility of summitting via several non-technical trekking routes and due to the sometimes dubious honour of being one of the Seven Summits – but Mount Kenya offers a wealth of excellent and diverse climbing possibilities on rock, snow and ice. The rock on Mount Kenya can be of variable quality but is at it’s best high on the mountain where the syenite rock is similar to granite – rough, hard and well endowed with features. Apart from the superb climbing potential on Mount Kenya, its tarns and alpine meadows; exotic, equatorial, high-altitude vegetation; sunbirds, hyrax and soaring eagles make the walk around the peaks one of the most beautiful expeditions in the East African mountains. After the cultivated farmlands on the lower slopes the trails pass through the rain forest, rich in trees of many species but noticeably camphors, then onto a bamboo zone growing to heights of more than 12m or more up through open moor land before reaching the moonscape of higher slopes. The forests are rich in wildlife including elephant, buffalo and monkeys with even the moor lands offering a long list of mammals including the rock hyrax, the nearest living relative of the elephant. Mt. Kenya is an ancient volcanic mountain much older than Mt. Kilimanjaro. It’s believed to have once reached well above 600m. What is left today is volcanic plug which erosion has fashioned into the complex jagged outline of the central peaks. The last stretch from the nearest town to the various trailheads (typically +/- 25km) will be on dirt roads and these can be in poor condition (especially in wet weather) and require a 4WD, or an approach on foot. Although, Mount Kenya can be climbed all year round, the highest rainfall occurs between late March and the middle of May, and slightly less between late October and mid-December. Maximum rainfall occurs in the forest belt and on the south-east side of the mountain where it reaches 2500mm. per year at 3000m. Rain and, higher up, snow can however be encountered at any time of year – even in the driest periods (January and February). Normally the drier seasons are associated with clear, dry weather which can last for many days on end. The best weather is generally in the mornings, and convectional rainfall, if any, tends to come in the mid-afternoon. Temperatures vary considerably with height and with time of day. At 3000m. Frosts can be encountered at night while day temperatures range from 5 to 15°C. Night time temperatures on the summit are well below freezing. The south-facing side of Mount Kenya receives more sunshine in the December to March period. During this time rock climbs are “in-condition” and snow and ice climbs gradually deteriorate. In the June to October period the north-facing rock climbs and south-facing ice climbs are best. It’s safest to climb Mt. Kenya during the dry seasons: January – February and August to September off the most reliably fine weather. The main routes are likely to be more crowded at this time of the year. If you favor complete solitude over the sunny skies, try going slightly off the peak season. It’s best to avoid the two rainy seasons from mid-March until June and from late October to the end of December. Mount Kenya is home to some fascinating high-altitude alpine vegetation including giant groundsels and lobelias. In the lower-altitude forest zone trekkers may come across some rather large and uncompromising African wildlife such as elephants and buffalo – fortunately these are mostly active only at night. Lions, leopard, rock hyrax, various antelope species and a wide range of other creatures large and small occur in the park. There are three main routes, which penetrate the forest and the moorland. The routes are Naromoru route, Sirimon route and Chogoria route and each of which has something different to offer. The Trek Mount Kenya Climbing Expeditions has offers for the below hiking routes. It is possible to combine hiking Mt. Kenya with Kenya safaris. Climb Mount Kenya Naromoru route – The fastest route to point Lenana but not as scenic as the other two. It is often overcrowded with many climbers since it’s the most popular route compared to Chogoria route and Sirimon route trek Mount Kenya. Mount Kenya Climbing Chogoria route – The most scenic and interesting of the three main routes on the mountain. The route passes the enchanting Hall Tarns and looks down sheer cliffs into the spectacular Gorges Valley and onto the beautiful Lake Michaelson. Climbing Mount Kenya Sirimon route – The least used of the three main routes, but features the most gradual ascent profile and best acclimatisation options and above all the most interesting since its on the drier side on the mountain. The route passes through impressive Yellowwood forests in the lower reaches and features abundant wildlife and beautiful alpine scenery higher up. There are other four climb Mt. Kenya routes up Point Lenana but are least known and used. These are: Burguret Route, Timau Route, Meru Route and Kamweti Route all at different Mt Kenya elevation. Note: The normal pattern of weather on Mount Kenya is for clear mornings with mist closing in from 10:00am although this can clear by evening. Therefore, early morning climb Mt Kenya starts are the order of the day with a 2am start for the final ascent to point Lenana, if you want to catch the sunrise. Go to Mount Kenya now and experience the majestic sunrise over Mt. Kenya. Sirimon route Mount Kenya is one of the best routes to use to hike to Lenana Peak. Need to learn how long does it takes to climb Mount Kenya? Read below Climbing Mt Kenya itineraries and pricing that might be of help in making your hiking Mt. Kenya plans. The Gorges Valley is a major feature on the Chogoria Route. This route leads from Chogoria town up to the peaks circuit. The 32 km (20 miles) from the forest gate to the park gate are often done by vehicle, but it is also possible to walk. There is much wildlife in the forest, with safari ant columns crossing the track, monkeys in the trees, and the potential for seeing elephant, buffalo and leopard. The road is not in good condition, and requires careful driving and walking. Near the park gate the bamboo zone starts, with grasses growing to 12 m high (40 ft). Once in the park the track passes through rosewood forests, with lichens hanging from the branches. At one point the path splits, with the smaller track leading to a path up the nearby Mugi Hill and across to Lake Ellis. The Temple is a large overhanging buttress overlooking Lake Michaelson, close to Hall Tarns.Near the trackhead a small bridge crosses the Nithi stream. Following the stream downriver a few hundred metres (yards) leads to The Gates Waterfall. The path heads up a ridge above the Gorges Valley, with views to the peaks, Lake Michaelson, The Temple, and across the valley to Delamere and Macmillan Peaks. Hall Tarns are situated right on the path and above The Temple, which is a 300 m (1,000 ft) cliff above Lake Michaelson. As the path carries on it crosses the flat head of the Nithi River and then the slope steepens. The path splits, heading west to Simba Col, and south west to Square Tarn. These are both on the Peak Circuit Route of hiking Mt. Kenya. Vertical bog on Mount Kenya on the Naromoru Route. 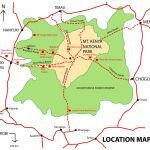 This route is taken by many of the trekkers who try to reach Point Lenana. It can be ascended in only 3 days and has bunkhouses at each camp so a tent is not necessary. The terrain is usually good, although one section is called the Vertical Bog. 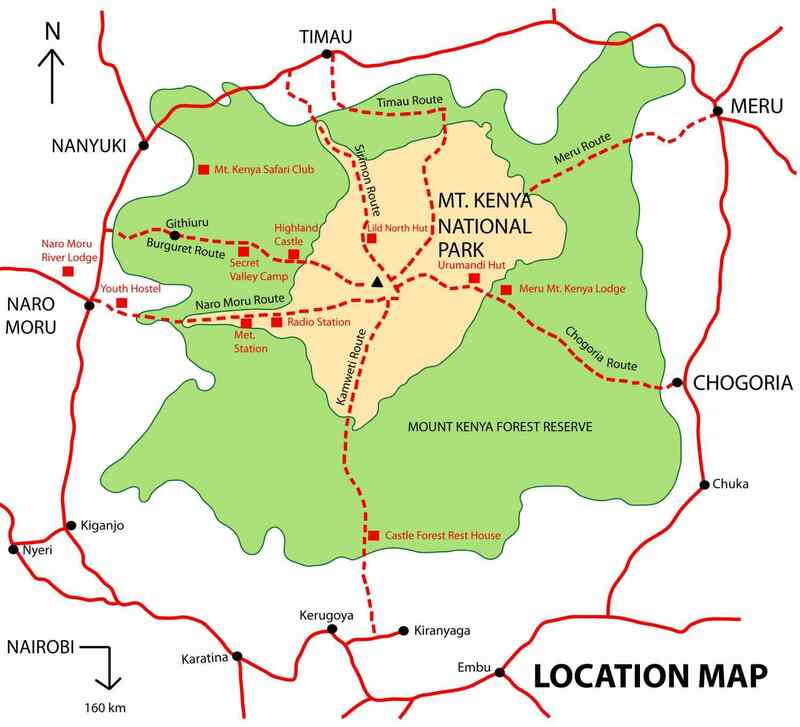 Go to Mount Kenya climb via Naromoru route – The track starts in Naromoru town and heads past the Park Headquarters up the ridge between the Northern and Southern Naromoru Rivers. At the roadhead is the Meteorological Station, to which it is possible to drive in the dry season. The route drops down into the Northern Naromoru Valley to Mackinder’s Camp on the Peak Circuit Path. 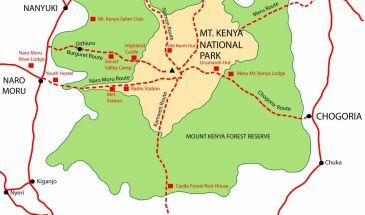 This route starts 15 km (9 miles) east around the Mount Kenya Ring Road from Nanyuki. The gate is 10 km (6 miles) further along the track, which can be walked or driven by two-wheel drives. The track climbs up through the forest. On the north side of the mountain there is no bamboo zone, so the forest gradually turns into moorland covered with giant heather. The track ends at Old Moses Hut and becomes a path. This continues up the hill before splitting into two routes. To the left, the least used path goes around the side of the Barrow, to Liki North Hut. The vegetation becomes more sparse, with giant lobelia and groundsels dotted around. The path climbs over a ridge, before rejoining the main path ascending the Mackinder Valley. Shipton’s Cave can be found in the rock wall to the left of the steep path just before reaching Shipton’s Camp. From Shipton’s Camp, it is possible to ascend the ridge directly in front of the camp to the site of Kami Hut, which no longer exists, or follow the river up to Lower Simba Tarn and eventually to Simba Col. These are both on the Peak Circuit Path. The glaciers on Mount Kenya are retreating rapidly. The Mountain Club of Kenya in Nairobi has photographs showing the mountain when it was first climbed in 1899, and again more recently, and the retreat of the glaciers is very evident. Descriptions of ascents of several of the peaks advise on the use of crampons, but now there is no ice to be found. There is no new snow to be found, even on the Lewis Glacier (the largest of them) in winter, so no new ice will be formed. It is predicted to be less than 30 years before there is no more ice on Mount Kenya, climbing & trekking Mt Kenya. The area of glaciers on the mountain was measured in the 1980s, and recorded as about 0.7 km² (0.25 square miles). This is far smaller than the first observations, made in the 1890s. Mt Kenya climbing Itineraries, Mt Kenya Climbing Gears, Mount Kilimanjaro Climbing Needs, Mount Kenya porters, Climb Mount Kenya, Mount Kenya Guides, Climb Mt. Kenya, Climbing Mt Kenya Routes, What you need while hiking Mt Kenya Climb and check out facts about Mount Kenya and history. 5 Days Budget Trip to Masai Mara, Nakuru Lake and Naivasha.